The Hover Sheep is a common denizen of many habitable planets1. 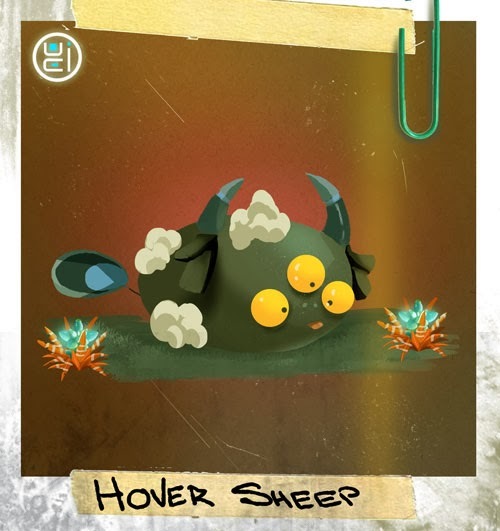 A peaceful, simpleminded creature, hoversheep tend to float their way through grassy meadows, eating whatever vegetation can be found – grass, bushes, or your crops. 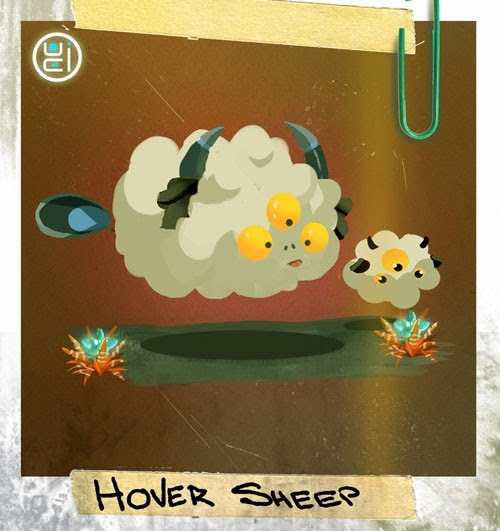 No one knows how hoversheep manage to navigate through the air, although it is widely known that their wool is responsible for the sheep’s ability to hover, and hover wool is widely used for sweaters, socks, and a number of atmospheric flying craft engines. Once a hoversheep has been sheared, it will fall to the ground, moving around in an oddly charming, bouncing fashion. Hoversheep have three eyes, perhaps to help them better see inside a Sandworm’s throat as they’re being swallowed whole. And speaking of third eyes, I swear that McKenzie Drescher has one in the back of her head. It’s the only way she could have seen me and Roz duct-taping her snotty-nose intern to one of the rams yesterday. I say it was worth both our steady paychecks to see the look on that kid’s face as he went airborne, though. See McKenzie? We can both play these games now that I’ve hacked your account. And since you’re firing me anyway, I may as well write what I really think of Hoversheep. I don’t care what anyone says, Hoversheep are a nuisance! I swear, if I ever catch a stray, I’m making me a leisure suit, complete with an Ike Jacket, so I can hover over your next garden party like an acerbic little rain cloud while your pet project flops helplessly in the mud. Okay, guess that’s it. It’s off to find a gig digging holes again for me on Monday morning. Cheers, McKenzie2. I hope *your* supervisor enjoys your latest lab report. P.S. p@ssw0rd ? You gotta be kidding me…. 1 Along with a number of other creatures, it is thought to have been carried to numerous planets by a race of ancient starfarers, the Plodds, who settled new worlds with creatures from their home planet. These creatures would inevitably run rampant on their new planet, destroying all previous undiscovered life. The Plodds found this similarity to their own home incredibly comforting. Colonists should not find the lack of diversity on alien worlds surprising. The Plodds were also the inventors of the chain restaurant.